Shells like this one very rarely come out of collections. Especially a dug shell. 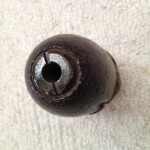 It is in immaculate shape, complete with lead sabot and the brass fuse adaptor for a wood drive fuse. This is another piece that came out of the New York artillery collection. The Hotchkiss Shell was patented on Oct. 9, 1855. Some of them will have the Patent Date embossed on the bottom of the shell. This one does not. 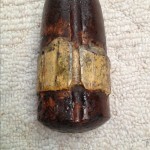 I do have a picture posted of an exploded Hotchkiss Shell fragment showing the patent date. The best part is, it was dug in Gettysburg! !